Upstart got tired of grinding out sales against deepening yearly losses? Analysis In buying Nimble Storage for $1.2bn, HPE has signaled that it needs a complementary all‑flash array architecture to its 3PAR StoreServ arrays. HPE is also, in buying Nimble, returning to public cloud storage as Nimble’s Cloud Volumes run in its own cloud. Nimble was one of three hybrid array startups, along with Tegile and Tintri, that re‑invented the SAN array and came to the fore as fresh-faced startups in the 2010-2014 period. It IPO’d in December 2013 and shares peaked at $52, but then fell severely back. The company’s lateness to the all‑flash array market didn’t help, but it recovered from that and there have been strong hints it is developing a hyper-converged offering. We believe that joining forces with HPE enables us to further accelerate the pace of innovation that has been a hallmark of our value proposition to customers. 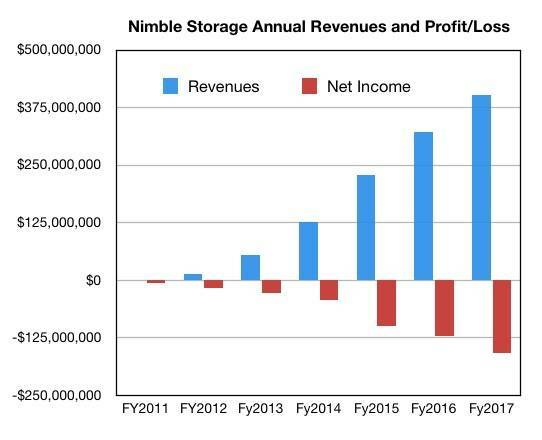 It’s immediately apparent that Nimble has been dashing for growth in revenues and operating at a loss as it builds out its infrastructure and develops products. The net loss has been slowly shrinking over the past three quarters, but not dramatically. The company is facing increasing competition as the all-flash array market matures and both hyper-converged infrastructure appliances and the public cloud take larger and larger bites out of the external array storage market. With Dell buying EMC and HPE buying SimpliVity, it must appear that the era of the survivable and profitable major stand-alone storage company is over. NetApp is the only one if its kind and, by fleeing into the dollar-lined arms of HPE, Nimble has settled for safety. It can use HPE funds to develop its product, HPE’s back-office to save its own back-office expense, and HPE’s channel to expand its own channel – and maybe enable it to slough off some sales heads as it cuts costs. There are 1,300 Nimble employees and we don’t, sadly, imagine all will survive the acquisition. An all-flash and hybrid flash/disk array line that slots in between its 3PAR (StoreServ) high-end arrays and entry-level MSA storage. The highly regarded InfoSight cloud-based Nimble array monitoring and predictive analytics package. It says it will bring this to its other storage products and that should be a feature its customers will value highly. Nimble’s Cloud Volumes, which have data stored in the public cloud near Amazon and Azure data centers to support cloud compute, and offer data portability between AWS and Azure. But HPE could shrink its 3PAR line to go down-market, build out its own analytics and enter the public cloud storage market itself. It’s chosen to buy Nimble for a billion bucks and get itself technology for these three areas faster. Dell EMC, with its all-flash XtremIO, VMAX and Unity, and coming all-flash Isilon, will now face an HPE punting 3PAR against VMAX and high-end XtremIO and maybe Unity and Nimble against Unity and XtremIO. It will see HPE as a stronger but not yet equal competitor in the basic all-flash array market. The InfoSight offering will be strong competition to any Dell EMC equivalent and Dell EMC has nothing like Nimble Cloud Volumes, but it could, if it wished, develop them. Dell EMC will be reassured that its decision that size matters as an IT supplier is being vindicated by HPE, swelling itself up with SimpliVity and Nimble. Looking at this from a NetApp point of view then, NetApp has three all-flash arrays: E‑Series, SolidFire and All‑Flash FAS. The 3PAR and All-Flash FAS arrays are sort of equivalent. HPE doesn’t have a stripped-down, fast E‑Series box equivalent, but Nimble looks sort of like a SolidFire equivalent, especially if its HCI intentions mean it has the wherewithal to create a single virtual block storage pool across multiple Nimble nodes. What does this mean for Pure Storage? HPE now has a commodity, off-the-shelf-based all-flash array with no proprietary ASIC, which is the 3PAR badge of honor – or dishonor if you are a COTS supporter. HPE will be able to sell its AFAs into a wider spectrum of businesses and the InfoSight capability is probably better than anything Pure has in that line. The Nimble Cloud Volumes look a neat way to push hybrid IT and Pure has nothing to answer that with. So HPE emerges as a stronger Pure competitor with Nimble. Lenovo, which has an alliance with Nimble, said: “Lenovo is aware of today’s news regarding the planned acquisition of Nimble Storage by Hewlett-Packard Enterprise. Change is continuous in our industry, so our strategy and operations are highly agile. We can adapt quickly to any market developments. As far as Kaminario is concerned, life will probably get tougher as HPE punts out Nimble AFAs through its channel and extends the Nimble product range’s market coverage. Tegile and Tintri will also find themselves facing stronger competition, and will run into HPE-3PAR-Nimble more often in their customer bids. They are, along with Kaminario, arguably the losers from this. The HPE-Nimble deal shouldn’t affect Cisco much in the short term but will affect it if and when HPE extends InfoSight support to its hyper-converged offerings. In fact, all hyper-converged infrastructure vendors will have to up their monitoring and analytics game to match an HPE HCI-supporting InfoSight.